Part Two: Record your own impulse responses with Reaper's ReaVerb. Read Part 1. Last month's Reaper column looked at creating convincing convolution reverb, using the comprehensive processing capabilities offered by the ReaVerb plug-in. This month, we'll investigate tools within ReaVerb that allow you to capture your own impulse responses of reverberant spaces on location, as well as some further creative possibilities offered by the Impulse Generation section of the plug-in. Prior to recording an impulse response on location, you'll need to set up an appropriate project-file template in Reaper. This prepares the test (or 'excitation') signal for playback in the acoustic environment and the subsequent recording of the impulse response. Open a new Reaper project and save it, naming it something like 'IR template'. Ensure that buffer settings on the audio driver are set as low as possible to minimise latency when recording. Create three new audio tracks. The first audio track will be a utility track that is only used to generate and decode the test signal for the impulse response. Name it 'Utility' and insert the ReaVerb plug-in into the signal chain using the FX button. Press the Add button in the Impulse Generation section and select File. Since we don't wish to load up a pre-existing impulse response, select the Cancel option when prompted. Towards the bottom right-hand corner of the plug-in window are the 'Impulse Generation Utilities'. 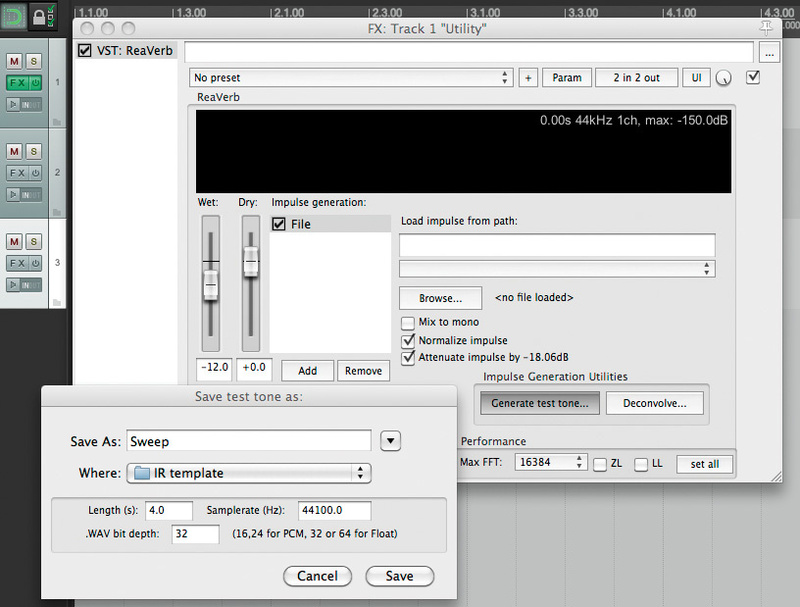 Using the Generate Test Tone button, create a four-second test signal named 'Sweep' and save it in the project folder. This action produces a sine-wave sweep from 20Hz to 20kHz, used to excite the room acoustics when measuring the impulse response. 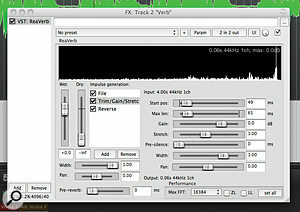 Creating a four-second sine-sweep test tone and saving it into the designated project folder. 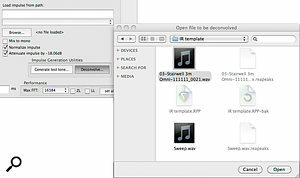 The Impulse Generation utilities are only visible when 'File' is selected in the Impulse Generation section of the plug-in. 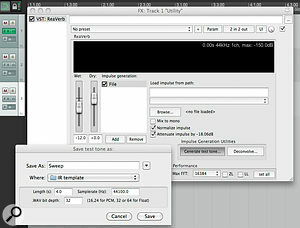 Navigate to the 'Sweep' audio file on your computer and drag and drop it onto your second audio track in Reaper. The track name will change to reflect the name of the audio file. Set the locators so that they accurately encompass the Sweep file on screen. 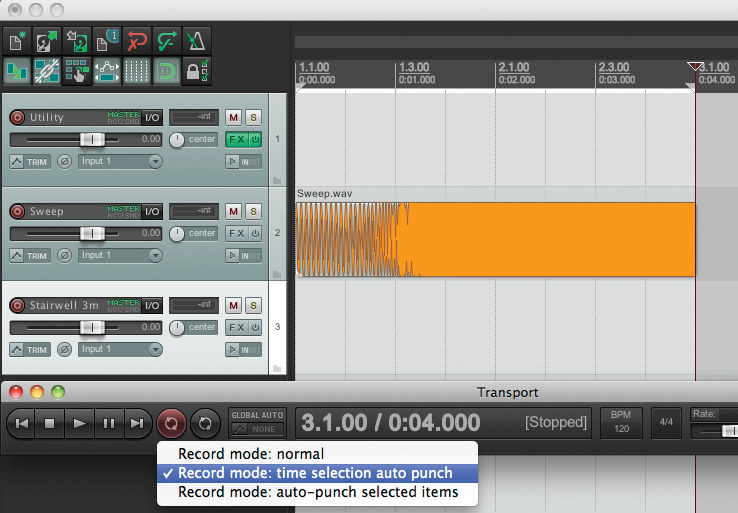 Right-click the record button on the transport bar to select 'Record mode: time selection auto punch'. 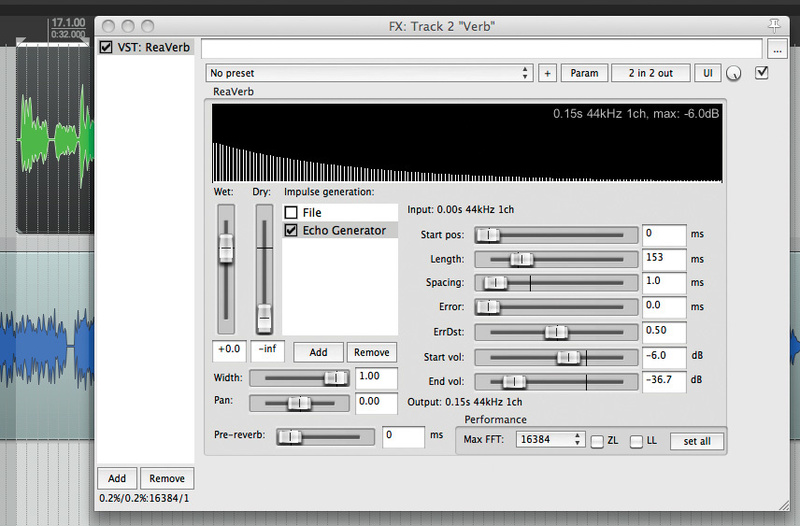 This ensures that the sweep and the recorded impulse-response audio files end up the same length as each other. The third track should be named according to the room or acoustic environment you will be measuring and is where the impulse response file will be recorded. 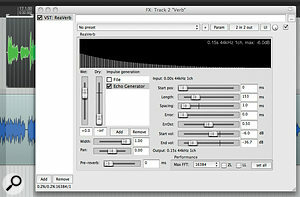 Select the appropriate input(s) and arm the track for recording. After the first impulse response is recorded, subsequent alternative responses can be recorded using the same test signal. The simplest way to do this is to create a new audio track for each response, name it accordingly and then record. 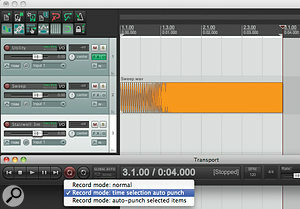 Naturally, when using this method you need to take care to mute all other tracks containing recorded impulse responses. This is the impulse-response project template ready to go. Carefully placed locators surround the test tone, the auto-punch record mode is enabled and the third track is named to appropriately reflect the acoustic space being measured. Although a formalised series of ISO regulations exists for the measurement of impulse responses, it is most likely that recording engineers will employ an active studio monitor to reproduce the test signal, with omnidirectional condenser microphones situated at a sufficient distance to capture the acoustic response. A spaced (A-B) pair of omnis performs strongly in this application to achieve a sense of immersion and stereo-field spatialisation. If omnidirectional microphones are not available, a coincident pair of cardioids in X-Y or ORTF formation will suffice as an alternative, but might need to be placed further away to capture enough ambience. A laptop computer and a bus-powered audio interface providing phantom power are also essential parts of your armoury, minimising the requirement for power sources at opposite ends of a large space. Experimentation, as ever, is the key to unlocking interesting reverb effects. You may consider capturing a number of responses in each acoustic setting with varying distances between microphone and speaker, making changes to their relative heights and tilting the speaker to emphasise specific reflections and resonances. 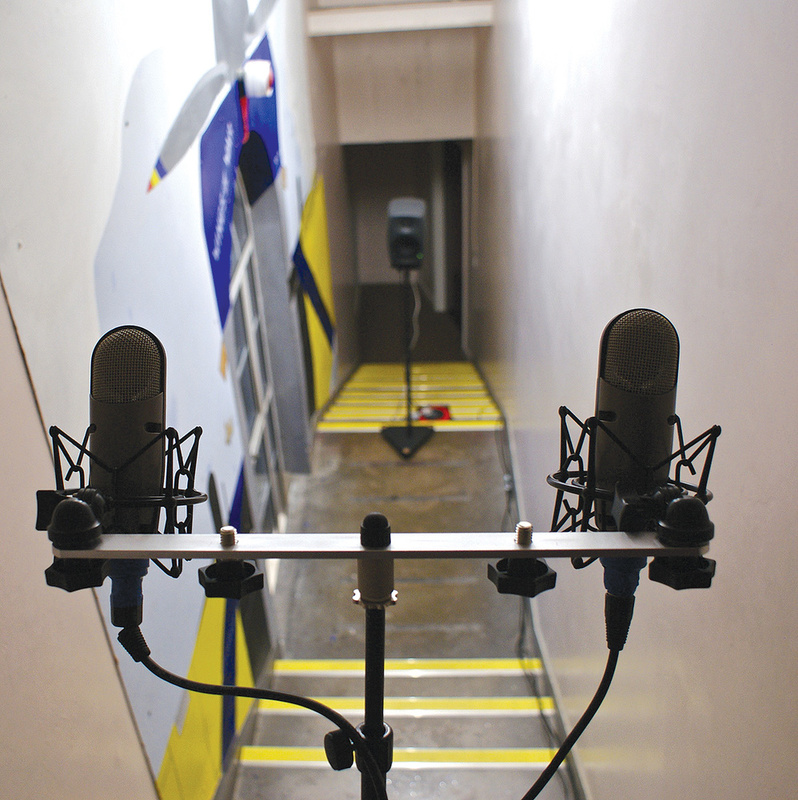 Environments such as reflective stairwells provide interesting, resonant reverb effects for instruments such as snare and guitar, and the process represents a modern-day equivalent to genuine chamber reverb without resorting to any digital modelling. For further ideas on technique, refer back to the Creative Convolution article from September 2010, available online at /sos/sep10/articles/convolution.htm. A spaced pair of omnidirectional microphones recording an impulse response in a large, narrow stairwell. An active speaker is used to emit the test tone from a lower position. The response was recorded at different distances and with the microphone and speaker positions switched around. Call up the ReaVerb plug-in previously inserted on the 'Utility' track. Select File in the Impulse Generation section. Click the Deconvolve button and select the impulse response recording to be deconvolved. You will be prompted to specify a path and file-name for the finished impulse response: a good place would be in a new folder in your library of third-party impulse responses. After a few seconds, the deconvolved impulse response will be created and ready to use. Here we're selecting the recorded impulse response to be deconvolved. Following this step, the user is asked to specify a path and file name for the finished impulse response. The finished impulse-response file can be freely loaded into the ReaVerb plug-in to yield original and interesting reverb effects in productions, with further creativity afforded by the range of impulse-response manipulation processes explored in these articles. Read Part 1. There's more on the techniques discussed here in the expanded online article. Check it out at /sos/jan12/articles/reaper_notes_0112.htm. Carrying on from last month's exploration of the impulse generation section within ReaVerb, there are two further processes that may be of interest to those striving for original reverb effects. The first is the reverse function, which does exactly what you would expect. Before creating a reverse reverb it is wise to employ the processing tools offered by 'Trim/Gain/Stretch' to limit the length of or compress longer impulse responses. This adjustment helps to create a more effective, immediate reverse reverb effect may otherwise be confusing to implement if the impulse response has already been reversed! Picture 5 shows the time-limited, reversed impulse response waveform in the plug-in display window. This image shows the effect of the Reverse function introduced using the Impulse Generation section of the plug-in. Here, the Start Position and Max Length parameters within 'Trim/Gain/Stretch' are being used to provide a more immediate and noticeable reverse reverb. The second process is a form of digital synthesis that can be used to generate additional early reflections at the beginning of an impulse response. These additional reflections can add to the initial brightness and subtly change the character of the reverb. Click the Add button in the Impulse Generation section and select Echo Generator. Picture 6 depicts the Echo Generator being used to create a series of early reflections and, for visual clarity, the underlying impulse response file has been removed. For highly original reverb effects you may wish to experiment with more extreme settings using the Length and Spacing controls. Synthesising early reflections using the Echo Generator function. The reflections shown on the plug-in display window occur in the first 0.15 seconds of the impulse response and may be superimposed on top of a recorded impulse response when one is loaded in the File section. 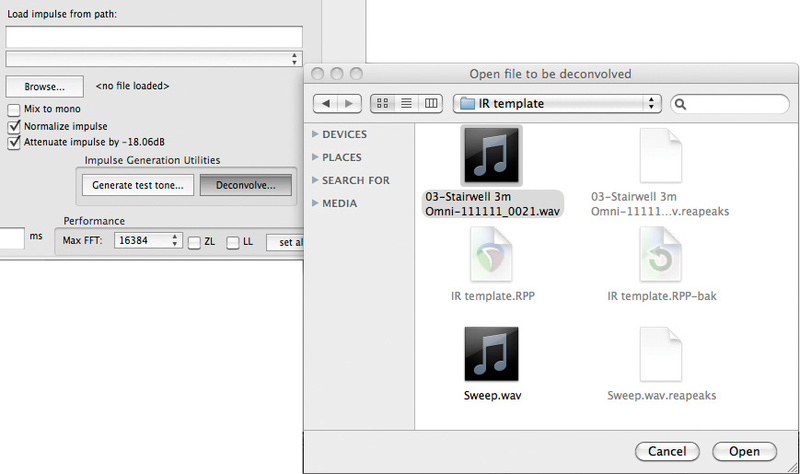 Navigate to the project folder and manually delete the original sine sweep test signal named 'Sweep'. In the plug-in window, use the Generate test tone button to produce a new sine signal with exactly the same attributes, path and name as the file you just deleted. Deconvolve your series of recorded impulse responses using the Deconvolve button in the plug-in window. The simplest methods for measuring impulse responses include the use of popped balloons and starting pistols as impulses to excite the acoustic reflections within a room. For this method, the excitation signal is simply cut from the start of the audio file to reveal the finished impulse response. However, with limited frequency response and problems with repeatability, these techniques may represent only an approximation of the acoustic environment. Other signals produced by non-mechanical means were developed to address the problems associated with balloon pops and pistols, and these include extremely short bursts of noise that represent the widest possible frequency range. Research has shown that, whilst such signals are useful in relatively noisy environments, impulse responses recorded using this technique may suffer from distortion peaks. It was later discovered that a sine wave, sweeping progressively over the entire frequency range could be used as an excitation signal to produce impulse responses with a superior signal-to-noise ratio, free of any unwanted artefacts. Given these distinct advantages, plug-ins and dedicated software for impulse response measurement tend to utilise the sine sweep method for the room excitation signal. They offer a choice of durations for the sweep — often up to 50 seconds — to allow for ultra high-resolution impulse capture.